Butterfly Reflections, Ink. : Bunny Slopes, Anyone? 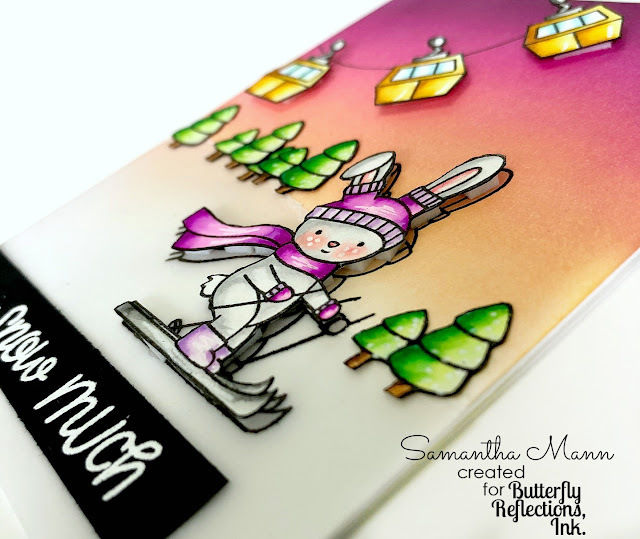 Samantha here, and today I am sharing a cute little winter scene with some Neat and Tangled stamp sets! I just LOVE how this came out! That bunny is just the cutest little skier from the Bunny Slopes Stam Set!! And, even though you can't tell, the hill was made with a piece of torn vellum! it looks cool in real life! Promise! I colored the images with Zig Clean Color Real Brush Markers and then fussy cut them out, but never fear!! There are also coordinating dies! The background was ink blended with Dried Marigold, Picked Raspberry and Seedless Preserves Distress Inks!! I finished off the card with that heat embossed sentiment! Hope you like it! And hope you caught the shoppin' 'til you dropping' bug!